Over the next two years SCHOTTEL HYDRO will deliver 16 SCHOTTEL Instream Turbines (SIT) with a capacity of 62 kW each to Sustainable Marine Energy (SME). The British company has signed a long term contract with the European Marine Energy Centre (EMEC) and will build a platform array in Scotland, off the Orkney Islands. Following successful sea trials in the Solent during summer 2015, the first PLAT-O system, which hosts two SIT, will be installed at EMEC in 2016. The next generation PLAT-O system will be large enough to host four turbines. Four of these platforms will be deployed in 2016/2017 to complete the array. The installed power output of the array will be 1 MW and will be directly fed into the Scottish power grid. During the sea trials off the Isle of Wight, SIT and PLAT-O have successfully proven to be a perfect match. Both, the turbines and the platform, are designed to be lightweight, robust, stable and simple to provide an efficient integrated solution. PLAT-O aims to reduce the costs of delivering tidal energy considerably; one of the Earth’s most abundant and reliable renewable energy sources. PLAT-O is placed under the surface of the water and can flexibly adjust to the place with the strongest current. Besides a marker buoy, the system is not visible on the surface. The buoyant platform is taut moored to the seabed using a tailor made anchoring solution that has also been developed by SME. The PLAT-O platform array will host 16 SCHOTTEL Instream Turbines. The new turbine generation from SCHOTTEL HYDRO purposely avoids complex subsystems to ensure a lightweight and solid device, which is easy to maintain. 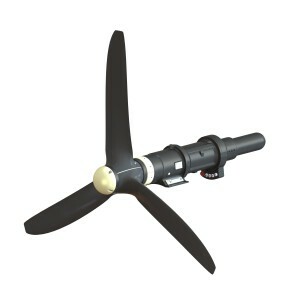 The SITs have a rotor diameter of four meters and are designed as downstream turbines which are self-aligning to the flow. The SIT design and features hydrodynamically optimized passive-adaptive composite blades with no need for any active pitch mechanism. Their drive trains are standardized with a two-stage planetary gearbox, an induction generator and a mechanical brake. The scope of supply also includes the power electrics for the turbines and the interface management between turbines and platform. “With this system we offer SME a simple “plug and play” solution for their PLAT-O platforms. We are very proud to be part of this project with 16 SIT turbines sold. The PLAT-O system provides SCHOTTEL HYDRO with a route to market and we expect to deliver many more SITs to SME for these systems in the near future,” says Niels A. Lange, Managing Director of SCHOTTEL HYDRO. The cooperation between SME and SCHOTTEL HYDRO demonstrates that tidal energy can be produced cost-effectively. “It is great to be working with SCHOTTEL HYDRO to deliver an integrated system to the market. This multi turbine array, the first of its kind in the world, will prove that tidal energy devices can be installed in a low cost manner and operated profitably over the long term,” says Jason Hayman, Managing Director of SME.